When looking back the one constant memory most musicians remember is where and when they began their journey. 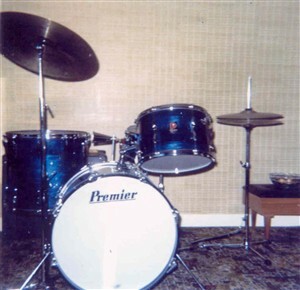 As for myself my own journey as a drummer began from modest beginnings well over forty years ago way back in the early days during 1971, when I was offered the gig with a local country and western outfit based in the Great Yarmouth area called The Cumberland Gap Trio. I was recommended for the gig through my association with organist Fred Short, who was the resident organist in the Coral Reef Bar during the 1970's, on the Britannia Pier situated on the seafront on what they call Great Yarmouth's golden mile. As for the Cumberland Gap Trio, apart from myself Joseph Harlow on drums was a Yorkshire man by the name of John Perrin on lead guitar and vocals, who at the time lived in Bodleian Court in Gorleston on sea, and Neil Armstrong a local man on lead vocals and rhythm guitar who also at the time lived in Ranworth Drive at Ormesby St Margaret. We rehearsed regular in a room above the Gorleston Social Club situated in the main High Street, a venue we also played on many occasions. Other local venue's that we played were The Yare Hotel, The Sandringham Hotel, The Broadway Motel, The Gunner and Divers Public House situated on the corner of Theatre Plain and Regent Road opposite the ABC Regal Theatre in Great Yarmouth both venues now long gone. On Sundays as well as playing at Divers Public House in the evenings, we also played a lunchtime gig in Norwich at a then landmark Norwich venue called The Boar's Head, situated on the ground floor beneath Norwich nightspot Barbarella's on the corner of Surrey Street and St Stephens in the heart of the city centre. A venue where I had my first encounter with entertainments agent and bandleader Roy Reymo, who booked us for the gig and who's band I eventually went on to play with for many years from the middle 1970's to the early 1980's. On the occasion after we auditioned for the gig at the Boar's Head alongside another local band called Natural Gas, I remember Roy took us upstairs to show us around Barbarella's Nightspot where Roy was appearing nightly with his own band alongside another well known Norwich cabaret entertainer Tony Weston, who I had the pleasure of backing in cabaret a few years later at another then well known Norwich Venue, The Tudor Hall in Rose Lane during my time with Roy's band. Barbarella's Nightspot also played host to many top stars who appeared there at the time such as Roy Castle Bob Monkhouse, singer Kathy Kirby and comedian Norman Collier who I also had the pleasure of backing in cabaret while playing with Roy's band a few years later. For the gig at the Boar's Head Public House with the Cumberland Gap Trio, we ended up playing as a four piece for the lunchtime session only as I recall Roy's bass player at the time sitting in with us on bass guitar. These days the building that once housed Barbarella's and the Boar's Head, still remains today but Barbarella's Nightspot and the Boar's Head Public House that were once popular Norwich entertainment venues are now long gone, and I guess fondly remembered by those who went there. Back on the east coast with the Cumberland Gap Trio, popular local venues that we played were The Florida Club a then recently opened venue back then on the Florida Holiday Park Estate in Back Market Lane in Hemsby and the Royal Oak Public House in Ormesby St Margaret, playing in the extended outbuilding of the pub at the rear of the venue. On one occasion at the venue I also recall us playing alongside another local band called Touch led by guitarist Tim Finn. The Royal Oak Public House was also once upon a time home for Trad Jazz as many top Trad Jazz bands appeared there over the years. These days the Royal Oak Public House now long gone, having once occupied the centre of the village of Ormesby St Margaret for many years, finally called time and the site in which the pub once occupied is now occupied by modern flats bringing the end of an area. Over the summer months during 1972, with the Cumberland Gap Trio venues that we played included Hotel Hermanus with the unique strangely shaped Hermanus Rondavels (Roundhouses) situated on The Holway in Winterton on sea. The unique Roundhouses at Hermanus were originally constructed by a previous owner during the 1950's after returning from a visit to South Africa's Hermanus Bay. When we played the venue back then in 1972, I remember two Roundhouses situated on opposite sides of the driveway at the entrance of the Hermanus site. Then after playing the gig one evening when leaving the venue down the driveway I saw the lights come on as we drove passed the Roundhouses, which I originally thought were part of the venues scenery and not holiday accommodation where the holidaymakers stayed, which I suppose is what makes the Hermanus Roundhouses so unique. The owner of Hotel Hermanus back then was a kraut(German) I believe, as I remember we auditioned for him earlier that year before the summer months of 1972. Although the Cumberland Gap Trio was mainly a country and western outfit, it was at the venue Hotel Hermanus I recall where I also remember performing one of my early drum solo's with the Cumberland Gap Trio, on an old jazz tune that we played called ''When The Saints Go Marching In''. Other venues we played over the summer months during 1972 along with Hotel Hermanus, these days known as Hermanus Leisure were the King's Arms Public House and the Never Turn Back Public House in Caister on sea. Originally from the North of England John our lead guitarist I assume, named the band after the stretch of road in the county of Cumberland(Cumbria) known as The Cumberland Gap, which incidentally skiffle legend Lonnie Donegan also had a big hit with the song ''Cumberland Gap'' about that stretch of road. On one occasion during the summer skiffle legend Lonnie Donegan's former drummer Nick Nichols, who was at the time living in the area in Station Road in Belton, deputised for me at one of our regular Saturday night gigs at the Never Turn Back Public House. It was a venue I will always remember because of its makeshift stage at the time, which consisted of a bunch of beer crates turned upside down covered by an old carpet that had seen beter days, priceless to say the least but also great fun. Drummer Nick Nichols while living in the area, also backed many well known stars who appeared in the summer shows at various theatres in Great Yarmouth such as Mike and Bernie Winters, who appeared at the Britannia Pier Theatre for the summer season of 1974. It was during this time I recall at the beginning of the summer season in 1974, before I decided to play the drums full time professionally. While working as a drivers mate for Norfolk Radio a local electrical retailer delivering electrical goods to various locations, when one day a job came in to deliver a TV to Mike and Bernie Winters dressing room at the Britannia Pier Theatre. When we arrived at the theatre dressing room I noticed a pair of drum sticks lying on the dressing room table which belonged to Bernie Winters, as he also played the drums. While I was there I got to hear the theatre orchestra with Nick Nichols on drums, rehearse a tune for the show which I recall was ''Up Up And Away'' which was a big hit for American vocal groups Fifth Dimension and the Johnny Mann Singers. Drummer Nick Nichols was also playing a late night gig throughout the summer season of 1974, at a nightclub called The Lantern which was a basement club situated in an alleyway off Great Yarmouth seafront next to the old Empire Theatre, which had an illuminated lantern hanging above the entrance door. At the end of the summer season in 1974, drummer Nick Nichols put an advertisement in the local newspaper advertising his Slingerland and Ludwig drumkits for sale before leaving for pastures new when he emigrated to South Africa, and I was offered his gig with the resident band of the Lantern nightclub which apart from myself on drums, included organist Richard Haylett and lead guitarist/vocalist Pete Yarwood. A few years later like drummer Nick Nichols who backed Lonnie Donegan, I also had the pleasure of backing in cabaret another skiffle legend Chas McDevitt, who along with Nancy Wiskey had a big hit on both sides of the Atlantic during the 1950's with Libba Cotten's ''Freight Train''. I remember when backing Chas in cabaret during the summer season of 1985, in The Holiday Inn at Vauxhall Holiday Park in Great Yarmouth. Apart from playing his hits ''Freight Train'' ''Greenback Dollar'' and tunes like ''Cotton Song'' Chas also enticed a member of the audience on stage to play the washboard as used in skiffle bands of the 1950's, and join in with us on an old jazz tune that I originally first played with the Cumberland Gap Trio, called ''When The Saints Go Marching In'' where everbody got a chance to shine or not as they say. 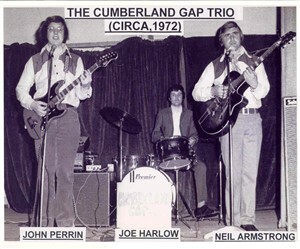 I had a wonderful time playing with John and Neil in the Cumberland Gap Trio, but towards the end of the summer months in 1972, I decided to move on and found myself playing drums for a well established local band called Silver Lining along with Tony Hackett on lead vocals, Barney Hackett on lead guitar and Danny Johns on bass. We played regular at the old Birds Eye Social Club now long gone, with the venue these days known as the Haven Bridge Public House situated on the corner of Steam Mill Lane in Cobholm, but that was a continuation of my journey as a drummer. During this period in the early 1970's, I played a blue Premier drumkit with the Premier 2000 snare drum and Zyn cymbals made for Premier at the time by the Italian cymbal company UFIP. Well its been a gas folks and as I said at the beginning most musicians have fond memories of where they began their journey, as these were my recollections of where my own journey began all those years ago back in the early days as drummer with the Cumberland Gap Trio. This page was added by Joseph Harlow on 08/04/2014. Do you have good memories of dances in the 1950s?